You can't make a saddle fit better with a specialized pad. I know, I know, there are SO many products out there that are designed to "make" a saddle fit better. But think about what they're trying to accomplish. A saddle is been designed to spread weight evenly over a large surface, and to center the rider on the seat. 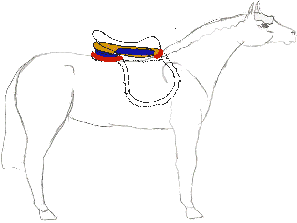 There is a "flare" at the front and back of the saddle, so that the edges curve away from the horse; if the edges don't curve away from the horse, they dig into his back. Using a specialized pad to alter the way the saddle sits, and will disrupt the saddle's balance and weight distribution. When a saddle is too narrow, it sits too close to the horse's spine. See Gullet Clearance for discussion of narrow saddles, and how they sit on the horse. 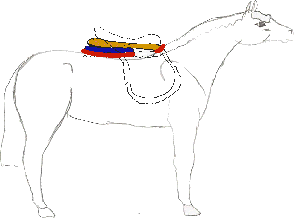 In the narrow saddle, the "points" of the saddle at the front are angled in, and so dig into the horse's shoulder. The gullet is too narrow along the saddle, and this pulls on the thin skin above the vertebrae. For some reason, the common solution to this problem is to use a nice, thick, good quality pad. I can't really understand it. If the saddle is sitting too close to the spine, there is nothing a saddle pad can do to change that. In fact, it makes it worse. A saddle pad does nothing but make a narrow saddle *more* narrow. It's akin to "The shoe is too small, let me add another sock to make it more comfortable." The weight of the saddle rests too close to the horse's spine, or presses too much against the horse's shoulder. Pads won't change where the weight rests, and will only make the points dig more into the horse's shoulder. A riser pad changes the surface under the saddle, and changes the direction of the weight of the saddle. The saddle tips. It may look like the saddle is sitting evenly (after all, that's why you're using a riser, right?) but the riser alters the positioning of the weight. Instead of carrying the weight of the rider evenly across the surface of the panels, all the weight is concentrated on the side opposite the riser pad. The flare at the back doesn't work the way it should. 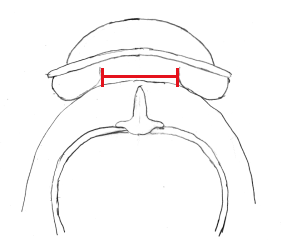 Since the saddle is tipped, instead of curving away from the horse's back, the tip of the saddle points right at the surface. The tip digs into the horse's back. Concentrating weight in any area creates a pressure point. You may notice the side effcts of pressure points after a ride: there are dry patches under the saddle, the hair is "swirled" in one spot, or even rubbed off. If you have ridden with a pressure point before, the horse's hair often grows back in white. A pressure point is exceptionally uncomfortable. It's rather like having a rock in your shoe. Instead of walking on the nice smooth sole of your shoe, you're putting a lot of weight on a small surface. If you walk that way for a while, you get sore; for longer, you get a blister; for too long, it'll wear right through your skin. You'll also be left with a deep bruise. A horse who has worn a badly fitting saddle, or one with pressure points, often has muscular damage. For more discussion of muscle issues, see equine sports therapy. Like risers, only they also put pressure directly on the spine. I never have understood that one. Not only does the lollipop create some bridging, but it presses directly on the fragile skin above the spine. Ouch. Again, these change the direction and distribution of the weight of the saddle. Pressure points are created, the flare at the edge of the panels doesn't work. 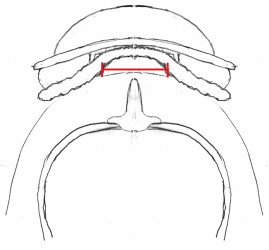 The saddle digs into the horse's back in some places, and bridges in others. Any pad with foam acts as an insulator. Instead of absorbing sweat and dissipating heat, the foam holds all the heat up against the horse's back. Many of the specilized pads (risers, lollipops, etc) are made of foam. There is a difference between absorbing and dissipating pressure. A gel pad *absorbs* pressure. When you use a gel insert in your shoes, this gel pad can absorb pressure along the length of your foot, and concentrates that absorbed pressure. When you're walking, the gel sole can let the pressure out in the contact with the ground. When you're riding, though, that absorbed pressure has to come out somewhere. It's either going to come out against the saddle and rider, or against the horse. If you're using a gel pad to equalize pressure points, then it most likely is accentuating those pressure points--making them much worse for the horse. If the saddle fits precisely, and the saddle has been fitted using the gel pad, then it will work as a shock distributor. But if there are any pressure points or there is any bridging, the gel pad will make the bad fit much worse. Pads made of synthetic materials are usually much more slippery. Synthetic materials don't absorb sweat the way natural fibers do (wool, cotton). So the pad gets damp, but the moisture stays on the surface. The already slick synthetic fibers become more slippery. The only instance in which a saddle pad can alter the fit of a saddle reasonably well, is when the saddle is too wide. If the saddle would fit well (the angles are right, the center of the panels sits well off the spine, there is no bridging) but is just a little wide...THEN a thick pad will help. Any material will compact over the course of a ride, however. The longer you ride, the thinner the pad will be. A thick pad should only be a temporary "fix." If the horse has lost weight but will regain it, or the horse is expected to put on muscle quickly, then the slightly wide saddle with a thick pad is a beneficial option. So what saddle pads should be used, then? A saddle pad's job is to protect the saddle from the horse, and protect the horse from the saddle. It absorbs moisture, but dissipates heat. It keeps the saddle more clean and dry. It prevents the saddle from becoming slick with sweat and slipping around the horse's back. It assists the saddle in dispersing pressure IF the pad is of a smooth, even thickness. A natural material such a wool or cotton will provide a moisture barrier without causing problems such as concentrating heat or pressure. If you have a saddle which does not fit properly, then your best option is to alter the saddle itself, or to get a new saddle. Using a "gadget" as a bandaid usually only makes the problem worse. An English saddle can be adjusted in many, many ways. Sometimes it's not worth adjusting the saddle, but in many cases a saddle can be made to fit well. See Customizing an English Saddle. The design of a Western saddle tree is very different. 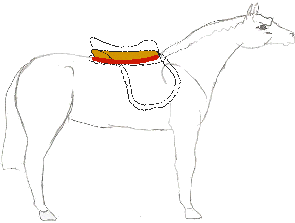 In cases where it does not fit, typically the Western saddle must be replaced. 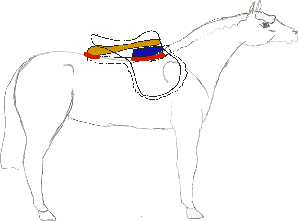 There is much less subtlety to fitting the Western saddle, however, and the basic fit may accomodate more shapes of horse than the variable English saddle.